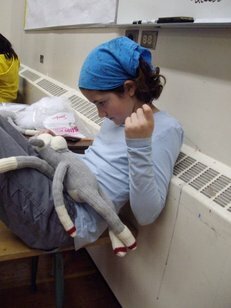 Gr.6 workshops - RAQ'n Monkeys - a whole new dance fusion ! RAQ'n Monkeys - a whole new dance fusion ! 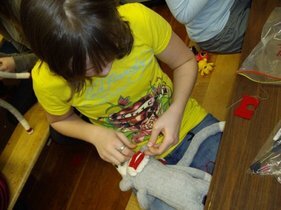 sock monkeys are the epitome of handmade toys from the 1930’s in North America. the pride on their faces = priceless. The step-by-step progression of this project is laid out so that builds on itself !! 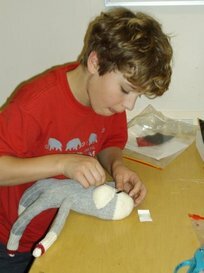 The children will learn each new skill as needed, and continue to incorporate them to the end product. Suggested 3-4 hours of classroom time… to complete, or be near completion of their project. “Art homework” may be required to finish up. An extra home assignment ? include clothing, hair, props, plus a unique personality, story, history, etc. have them be creative, recycle, and continue sewing !!! verbal presentation of their monkeys to the class is great public speaking practice.